Mechanical horse Ponycycle - three in one! One of the best things about the PonyCycle is that not only does it make a wonderful toy and provide a way for kids to get around, it is also a great form of exercise. When children move on their PonyCycle they train a specific group of muscles, meaning that they grow stronger and healthier while having a great time. Magic! The manufacturer has made a big effort to ensure that there is a PonyCycle to suit every child - so you can choose from loveable zebras, adorable ponies, cuddly tigers and regal unicorns. Take your pick, make your child’s dream come true and enjoy seeing the joy on their face. Riding on a PonyCycle is completely safe as long as a few simple rules are followed. The most important thing is to never leave a child unsupervised when riding. You should also find flat, solid ground. Hills should be avoided, because PonyCycles don’t have brakes! It is also better not to ride on bumpy surfaces. 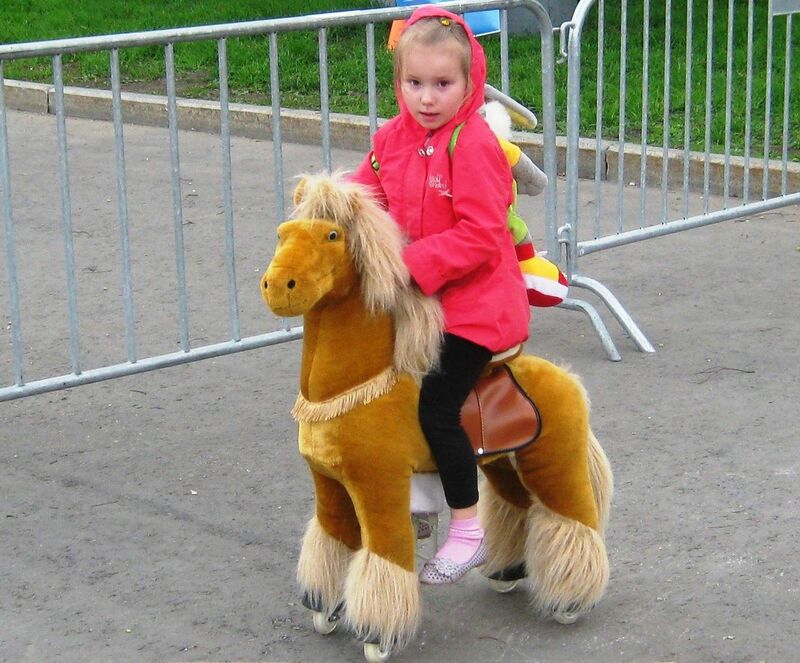 Children should also avoid putting their fingers between the saddle and the body of the PonyCycle because they could hurt themselves and damage the mechanism. When choosing a PonyCycle you have to think about price - and that’s why you should choose Ponycycle.biz. We sell directly from the manufacturer, allowing us to offer the best wholesale deals. We can also offer additional discounts to retailers. As for our retail prices, these can be found in the “Professional PonyCycle” and “Domestic PonyCycle” sections of our site. We offer two modes of payment - online through our site and in cash to the courier on delivery. Your PonyCycle will be dispatched within one or two days after an order is placed. On this page you can find information about PonyCycle’s “professional” models for rental. Professional PonyCycles are principally designed as an attraction for parks, shopping centres and other public places. Their sturdy metal frame allows them to be used not only by children, but by adults too. This frame, which makes the PonyCycle significantly stronger, is also heavier, meaning that the professional model weighs a few kilograms more than the home-use one. Another difference is that the pedals on the professional model can be moved to cater for users of different sizes. The professional model’s wheels are also slightly different, with a special mechanism that allows the PonyCycle to turn smoothly to the right and the left and prevents it from going backwards. Hard, flat surfaces are ideal for riding. The professional model’s body is reinforced with fibreglass and its soft cover has a zip that allows it to be removed for washing. Small - for children from 2 - 4 years and weighing less than 30kg. It is 78cm tall, with the seat 50 cm from the ground and 35 cm from the pedals. Medium - for children from 3-9 years and weighing less than 40kg. It is 95 cm tall, with the seat 64 cm from the ground and 45 cm from the pedals. Large - For anyone weighing under 90kg. It is 135 cm tall, with the seat 90 cm from the ground. Large PonyCycles are only available with the professional specification, and can be used by children and adults as long as they weigh less than 90kg. You can buy a large PonyCycle from PonyCycle.biz at a great price. Once you’ve got one, it can be rented out without any additional spending except for replacing the cover every 3-5 seasons. Although they look exactly the same as professional PonyCycles, home-use models are different in a number of ways. The frame is made from lighter steel and the body is built from styrofoam, making the the PonyCycles significantly lighter and therefore easier to move around the house. The pedals are fixed at a specific height and the wheels are made from polyurethane, allowing them to run cleanly over flat, smooth surfaces. Small - for children from 1.5 - 3 years and weighing less than 30 kg. It is around 70cm tall, with the seat 50 cm from the ground and 35 cm from the pedals. It weighs 7.6 kilos. Medium - for children from 3.5 to 7 years and weighing less than 40 kg. It is around 90 cm tall, with the seat 64cm from the ground and 45 cm from the pedals. It weighs 10.4 kg. The most important rules - don’t leave your child unsupervised when riding and hold on to them until you know that they can support themselves on the seat. In order to move the child just needs to stand up and down on the pedals. It’s a great toy for kids both outside and inside the home. Buy a medium PonyCycle for your child’s birthday, or any other special occasion, and make it a day they will remember for a long time! Play, ride and develop with PonyCycle! In our online store you can buy small and medium PonyCycles. PonyCycle.pro sells directly from the manufacturer, allowing us to offer the best retail and wholesale prices. History of mechanical toys for children already more than a thousand years. Primitive toys for children were similar to tools adults. So it was, because the children, especially the boys had to enter early adulthood. Boys were trained on wounded game or in the trees. Thanks to these toys child acquainted with the world and learned to survive. If the ancient, primitive toys were sent only to the physical development of the baby, then later in ancient China were first sophisticated toys - puzzles, mechanical models and unusual doll - puppet. Such toys educational children not only physically, but intellectually. It was in ancient China were first wooden constructors that are beneficial to the creative abilities and imagination. For three and a half thousand years the mighty Chinese civilization has made a great contribution to the history of world art, culture and technology. Mechanical devices created courtiers scientists and inventors, they were used in the building and organizing events for the emperor. In those days, was invented compass, clock, mechanical monkeys and tigers, special fountain in the shape of dragon heads, spray perfume. Later, all these devices have been found unnecessary and were destroyed by order of the emperor. Some pictures and drawings have survived. Survived and mechanical drawing of the famous horse. Mechanical horse was popular and in demand toy afford the luxury of emperors and could only approximate. The device allows you to simulate the effect of riding and arrange real competition. Mechanical horses were an important element of education, they were used as trainers for the preparation of future soldiers. Mechanical horses intended to participate in the celebrations is quite expensive and require the participation of artists and craftsmen. The internal mechanism was made of wood. Toy covered with leather and stuffed with straw. Unfortunately, not preserved specimens, was promoted to the present day. Modern mechanical horses made their high-quality materials, have a metal structure that is pleasant to the touch, safe and easy to use and look like real animals. Buy modern mechanical horse can Ponycycle in our online shop Ponytoy.pro affordable today. Pony cycle - a novelty in the world market of toys. This is a modern, pleasant to touch a horse, equipped with silicone wheels that will not scratch the floor and a special lever mechanism to ride it on the street and in the house, creating a feeling of riding. Pony cycles do not need recharging and operate without batteries, they move like living pony. It appears that this miracle - toys? Perhaps you've never seen before these wonderful and unique horses, you could only hear about them from fairy tales and ancient stories. Dalian Pony Toy Company made a fairy tale come true. "In 1995, our old director after retirement decided to develop an unusual horse for his grandson. None of the employees did not know the principle of operation of the future mechanical horse, which was invented 1800 years ago in the era of Three Kingdoms. After studying historical data, our director has found out that the mechanical horse comes into effect with the use of force and special hinged - lever mechanism. He spent more than one study, done about a hundred attempts and improved the original model. After some time, he was able to invent a magical PonyCycle and children of all ages the opportunity to ride on a beautiful mechanical horses. " After a successful invention of innovative toys Pony cycle our company began to mass-produce mechanical horses and has been recognized ponycycle in the US and European markets. Manufacturer Company never ceases to improve and perfect the model pony cycles for 10 years. They make the design more modern horses, was released in the sale of new animals (tigers, unicorns, giraffes). Currently available is the fifth generations of mechanical horses, all pony cycles is produced by modern technologies and compliance with international standards and pass the necessary checks. Consistently produce quality control horses Ponycycle and provides after-sales service. Children have an incredible imagination - they can be soaring from building to building as Spiderman one minute and captaining a pirate ship, piloting a jumbo jet or swimming with dolphins the next. A child’s fantasy world is made much richer by toys and costumes, which stimulate the mind and inspire the imagination.There is a hugely diverse range of children’s products currently available and sometimes it seems as though there’s nothing left that could truly surprise today’s kids. However, we believe that we offer something new that can bring endless delight to any child. We’re proud to present PonyCycle, a magical toy that doesn’t need any electricity to run - so no batteries or chargers! Children just have to get in the saddle, put their feet in the stirrups and bob up and down like they’re riding a real pony. PonyCycle’s innovative internal mechanism does the rest. Furthermore, it prevents the toy from moving backwards even when going up a hill.